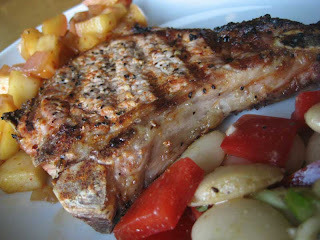 I found the recipe for Smoky Pork Chops with Spicy Applesauce and Garlicky Succotash in my favorite section of Rachael Ray's magazine, the 30 Minute meals section, of course. It was definitely easy and done within 30 minutes. You can find it in the September 2008 issue. My only complaint with this recipe is that I couldn't get apples very saucy. They were more liked baked apples instead of really saucy smooshy apples. I guess if I cooked them longer they could have gotten there, but I just followed the recipe's instructions. My husband actually liked the apples with a little bite to them and said this was one of his most favorite dishes ever. How about that for an endorsement, huh? I halved the recipe for the pork chops but made the full recipe for the sides and that worked out well. Here's the recipe with my comments in brackets. 1. Preheat a grill or grill pan. Season the pork chops all over with the grill seasoning and paprika. 2. In a large saucepan, heat 1 tablespoon EVOO, 1 turn of the pan, over medium-high heat. Add the red onion, season with salt and pepper and cook until softened, about 5 minutes. Stir in the chipotle with adobo sauce and the brown sugar and lower the heat to medium. Add the apples, cider and 1 teaspoon lemon juice and cook, stirring occasionally, until a thick, chunky sauce forms, 15 to 20 minutes. [Not so saucy for me, as I noted above, but still good!] Season with salt. 3. While the applesauce cooks, grill the corn until charred, about 5 minutes. Transfer to a bowl. Grill the seasoned chops until cooked through, 6 to 7 minutes on each side. 4. While the chops are cooking, in a medium bowl, combine the corn kernels, butter beans, bell pepper and scallions. In another medium bowl, combine the garlic, thyme, cumin and remaining lemon juice; season with salt and pepper. Whisk in the remaining 1/4 cup EVOO. Pour into the succotash and toss to coat. 5. Serve the pork chops warm with the spicy applesauce and the succotash. Congratulations on the blog and delicious recipe, I always visit. Thank you for your comment on Cuisine Quotidienne Madeline and a very Happy New Year to you. I love the new layout, although I haven't had enough time to play with it yet!